The ambiguity embodied by Zach Galifianakis is the truest and least comforting note in a movie a little too eager to reassure. The title phrase, It's Kind of a Funny Story, would not describe the previous films of Anna Boden and Ryan Fleck, who wrote and directed the crackhead teacher movie Half Nelson as well as the overlooked Sugar, the story of a Dominican immigrant playing minor league U.S. baseball. Boden and Fleck quickly established their signature serious-indie style: earnest, empathetic, tough-minded, not much fun. 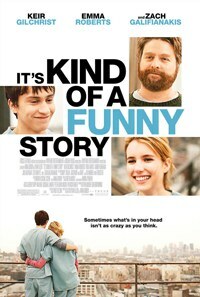 It's Kind of a Funny Story, based on the YA novel by Ned Vizzini, is their stab at another indie archetype, the quirky comedy, a more stylized, funny-sad sort of film in the style of Garden State or, especially, 500 Days of Summer. To tell the story of Craig (Keir Gilchrist), a depressed teenager who checks himself into a psychiatric ward without realizing he's agreeing to a weeklong stay, Fleck and Boden make quick forays into animation, fantasy sequences, and scattered narration. This kind of antsy playfulness feels appropriate to a teenager's story, as the ever-empathetic filmmakers make a valiant attempt to jump into Craig's head. Some flights of fancy, like a cast singalong to "Under Pressure" imagined as a glammed-up music video, are charming, but Boden and Fleck don't quite have the rhythm for glib, caffeinated comedy. Sometimes they seem to be staring at their own whimsical touches with a puzzled expression. Like Craig himself, It's Kind of a Funny Story is sweet-natured and likable, but not all that funny. The characters make for enjoyable company. Craig, hung up on his best friend's girl, forges a bond with Noelle (Emma Roberts), one of the only patients his age, and learns the ropes of institutional life. Having established some favorite themes in Half Nelson and Sugar, Boden and Fleck remain interested in low-key alienation, and how people cope with the pressures of their environments; their innate seriousness and humanity ensure that the movie won't overdose on quirkiness. But most of the characters are so nice that the mental ward never holds a sense of danger or mystery; recovery, for Craig, doesn't appear to be particularly elusive, his current stress and depression just another phase. Nothing much is at stake in It's Kind of a Funny Story, because the movie never really sells the pressures on Craig (to pursue an elite business school scholarship and fit in with his overachieving friends) as more than a mild irritation, despite his early suicidal thoughts (the movie opens as he's on a bridge about to jump, and not quite talked down by his parents, played by Lauren Graham and Jim Gaffigan). Boden and Fleck are so hopeful and open-hearted that Craig's journey starts to feel downright easy, especially in exploring his relationship with Noelle. Their pairing is no less preordained than in a glossy romantic comedy, albeit a charming one that sensitive younger audiences will probably enjoy. Strangely, the most vivid shot of realism comes from Zach Galifianakis. He plays Bobby, a patient who befriends Craig while hesitating to reveal too much about his broken family life, and he does so with most of the Galifianakis touches -- physical awkwardness, seeming non sequiturs, and a melancholy strangeness hidden behind that bushy beard. But this isn't a typical case of a comic actor playing cutesy-crazy. The movie is refreshingly ambivalent about whether Bobby can or will re-enter society with any success. It's the truest and least comforting note in a movie a little too eager to reassure.